When the Iraq war began, conservationist Lawrence Anthony could think of only one thing: the fate of the Baghdad Zoo, located in the city centre and caught in the war's crossfire. Once Anthony entered Baghdad he discovered that full-scale combat and uncontrolled looting had killed nearly all the animals of the zoo. But not all of them. U.S. soldiers had taken the time to help care for the remaining animals, and the zoo's staff had returned to work in spite of the constant fire fights. Together the Americans and Iraqis managed to keep alive the animals that had survived the invasion. 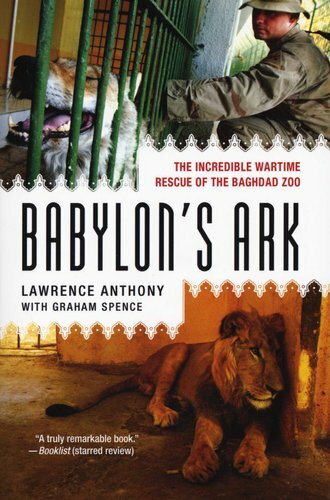 "Babylon's Ark" chronicles the zoo's transformation from bombed-out rubble to peaceful park. 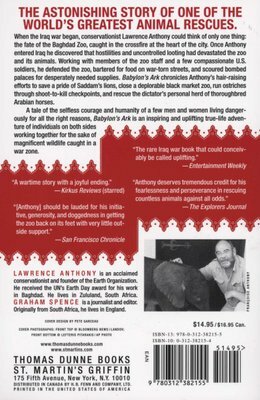 Along the way, Anthony recounts hair-raising efforts to save a pride of the dictator's lions, close a deplorable black-market zoo, and rescue Saddam's Arabian horses. His unique ground-level experience makes "Babylon's Ark" an uplifting story of both sides working together for the sake of innocent animals caught in the war's crossfire.